These clips make easy work of sectioning. 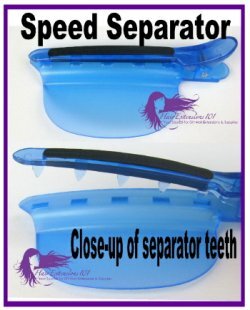 The Speed Separator Clip is intended for individual strand installs. Section a layer of hair and place the clip onto the sectioned layer of hair. The clip separates the strands for neat and uniform sectioning. Works well for fusion, shrink tube or ring applications. The Speed Separator Clip as a rubberized strip that holds the clip in place . The shield keeps hot tools away from the scalp to protect the scalp during installs.